Harry: Get your hand out of my head. I must find my source soon or fall. The nest below where I must be born. Alumnae Theatre has done students and friends of Canadian drama an invaluable service by reviving James Reaney’s first play The Killdeer (1960). Written in verse and set in a small Southwestern Ontario town, the language and the action are more metaphorical than they are realistic. This makes the play unusually challenging to stage and the current Alumnae production does not meet all those challenges, but it is headed in the right direction. The rarity of such a full-scale staging alone is enough to recommend it. The play is important not just for launching Reaney’s career as a playwright but for providing the first example of what would later be called Southwestern Ontario Gothic that finds strange and lurid doings beneath the seemingly placid façade of small town life. The conversation between Madam Fay (Tricia Brioux) and Mrs. Gardner (Anne Shepherd) that opens the play details the gruesome deeds that form the background to the action. Madam Fay was adopted by Mr. and Mrs. Fay to be a companion for their biological daughter but grew up feeling unloved and perpetually jealous of her new sister. When the daughter married, Madam Fay, also married, determined to destroy her sister’s happiness by running away with her sister’s husband. In revenge Madam Fay’s husband killed the sister, her children and then himself. One child, Rebecca, escaped the slaughter. Madame Fay’s son, Eli, witnessed all the carnage and has remained emotionally a child even into manhood. Eli was raised by the farmhand Clifford, who was Madam Fay’s lover and may have sexually abused the boy. In contrast to these tragic events of the past, the play proper begins with comic story of Harry Gardner (Paul Hardy), who is trying to free himself from the suffocating attention of his mother. Although he loves the egg-girl Rebecca (Blythe Haynes), the daughter of Madam Fay’s sister, his mother encourages him to marry the banker’s daughter Vernelle (Joanne Sarazen), who has proposed to him. Rebecca, in any case, is already engaged to Eli (Matt Brioux) and Clifford (Rob Candy), who did the wooing for Eli, will be his best man. The result of this and the complex backstory is to present us with three contrasting young people. Rebecca has no mother. Eli has a mother who hates him. Harry has a mother who loves him too much. All three have to battle the influence of the past to attain freedom in the present. That battle, however, is complicated with events that transpire during the five years that pass between Acts 1 and 2. Rebecca has been arrested for the murder of Clifford. From this point on the play becomes a murder mystery since most people believe that Rebecca has confessed to the murder to protect someone. The main difficulty in presenting the play is to set the tone halfway between realism and symbolism. The structure of the play itself breaks realist conventions with Harry’s direct address to the audience, with Mrs. Gardner and Mrs. Budge (Marie Carrière Gleason) suddenly fantasizing that they are crows and with Eli’s flashback in Act 3 to events preceding Clifford’s death. Besides this, the plot is resolved by the arrival of a deus ex machina in the person of the symbolically named Dr. Ballad (Peter Higginson), who brought all three of the young people into the world and has been following their fates. To this end Marysia Bucholc’s set does much to remind us we are not quite in the realm of realism. Two walls form a corner to represent Mrs. Gardner’s parlour and with minimal changes the courtroom where the concluding trial takes place. Yet, stage right of this interior is a dense forest and treetops extend above the walls to suggest civilization has made only so much of an inroad into nature and that nature is ready to retake what man has built. Bucholc represents Mrs. Gardner’s elaborate collection of knickknacks not on shelves as Harry describes them but hanging like Christmas ornaments on a tree inside the house – a brilliant detail to imply that human artifice has only decorated but not eliminated nature. More difficult than the physical setting is to achieve an acting style poised between the realistic and symbolic. 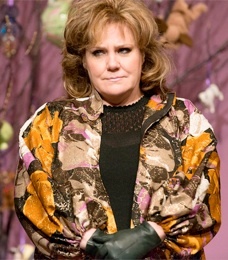 In general director Barbara Larose does not achieve this effect in a consistent fashion from her cast, though certain individuals and certain scenes get this effect exactly right. Blythe Haynes is the most expert at effortlessly maintaining the balance between between poetry and realism throughout the play. The impression she gives is that a spirit is speaking through her rather than that her words represent a specific personality. Others who achieve this difficult feat are Peter Higginson as Dr. Ballad and Rob Candy as Clifford. Matt Brioux comes very close to this ideal but shows more tentativeness than the three mentioned. Paul Hardy consistently conveys Harry’s sincerity but moves in and out of the ideal performance style, while Tricia Brioux gives an absolutely fiery performance as a human being whose inner torment causes her to become an embodiment of evil. Most of Act 2 is perfectly balanced, especially the scenes between Harry and the mysterious jailer’s wife Mrs Soper (Naomi Vondell), Harry and Death in the person of the hangman Mr. Manatee (Michael Vitorovich) and the final beautifully directed scene between Harry and Rebecca. Otherwise, scenes tend to veer between the purely realistic, as in the initial scene between Madam Fay and Mrs. Gardner, and the purely symbolic, as in the first scene of Act 2 between Mrs. Budge and Mrs. Delta (Tina McCulloch). The main misstep Larose makes in attempting to bring comedy to the final trial. There is humour in the scene, but Larose should not make the prosecuting lawyer Miss Jenkins (Joanne Sarazen) into a caricature since the responses she elicits are serious. A sense of awe rather than laughter would be more appropriate to Dr. Ballad’s appearance since he possesses and overview of all the events that none of the individual participants can have. Larose’s notion of beginning and ending the play with a round dance reflects Reaney’s ideal of appealing to the child within the adult and to his notion of plays as “play”. In Act 3 Rebecca realizes that play is exactly what Madam Fay has missed all her life and what has made her the way she is. The Alumnae Theatre has revived The Killdeer as its “Retrospective Choice” for this season as the company approaches its 100th anniversary. The choice reflects the great benefit that volunteer theatre companies provide in keeping theatre alive in communities and in mounting plays like this that commercial theatres, unfortunately, seem unwilling to touch. While the story is complex and the characters seem to speak in riddles, once you reach the surprising conclusion, you realize clearly that a search for the one’s family, one’s self, one’s identity is what the play has been about since the very beginning. Reaney broached this archetypal Canadian topic back in 1960 and his mixture of the comic and grotesque anticipates the work of George F. Walker and Daniel MacIvor. The Killdeer should be better known and we can only be thankful that a company like the Alumnae Theatre has chosen to bring its richness and importance back to our attention. Photo: (top) Paul Hardy) and Blythe Haynes; (middle) Tricia Brioux. ©2013 Dahlia Katz.